He was calm, cool, and easygoing. He was the member of my family we would turn to for sound, sane advice, and a clear vision of what was going on in our lives. He never raised his voice. He never lost his temper. Oh sure, he got angry a time or two, but if he did, I never saw him grow red in the face or take it out on anyone. He was an eternal pessimist. Oh yes, he was. If his beloved Cubs were doing well, or on their way to winning it all, he’d be the first to say, “They’ll screw it up.” We’d scoff and say he’s just being negative again, but doggone it, he’d be right. The Cubs would mess up and we’d be crying in our handkerchiefs all over again. He may have been a pessimist, but he was almost always right about it. He loved his family dearly. And we loved him. And now he is gone. And we miss him terribly. My Uncle, The Rev. 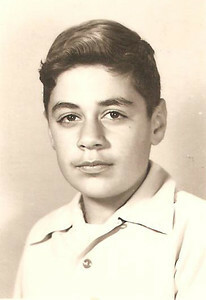 John D. Aiello, died on July 15 after a relatively brief but nonetheless extremely brave battle with cancer. He was 70 years old. 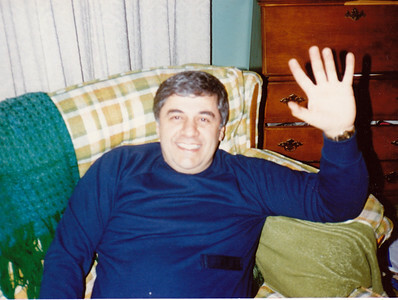 Uncle John was my dad’s younger brother. The middle child of three, he was destined for the cloth at a fairly early age– after my dad finally gave up the dream himself. He entered the Seminary after graduating from grade school, and was ordained a Catholic priest in 1969. Shortly after his ordination, my grandfather, “Nanu” Louis Aiello, died; and never got to see his son say his first mass. Over the years, Uncle John officiated at all family events– weddings, funerals, baptisms. It was a no-brainer– we always wanted him to do them, and he always accepted graciously. 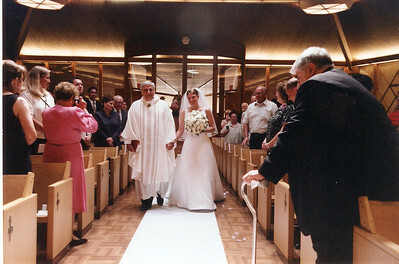 He officiated both my cousin’s wedding in 2001 and my sister’s wedding in 2002, and, in a bit of a change of protocol, walked her down the aisle because my dad wasn’t able to do so. They met my dad at the front of the altar, and he, with his cane, walked her the rest of the way. It was a moving and touching moment for all of us, and one we will never forget. Probably the most difficult thing he had to do was say the mass at Nana’s funeral. To this day, I don’t know how he did it. Perhaps it was because he loved her so much, and cared for her all the years she suffered. But whatever the reasons, he did it, and he got through it fine. I always thought he was so brave for doing that. My sister reminded me that we would always ask him for gum. Uncle John always carried sticks of Wrigley’s Spearmint gum, and he was always willing to share. I also remember he’d give my sister a kiss hello and say, “Oooh that tastes like Sarsaparilla!” or “Hmmm, I think that’s cherry pie!” They were just silly things he’d do with us kids, and we loved it. Uncle John had a wry, dry sense of humor. He was never one to be the “life of the party,” but every so often he’d just say a few words and have us all laughing so hard we’d start crying. Uncle John was Nana’s main caretaker after her cancer surgery, and stayed by her side through seven painful years afterward. It was hard on all of us, but hardest on him, because he saw firsthand how much pain she was in. When Nana finally died, a part of Uncle John went with her. My Dad’s death in 2006 was equally painful. 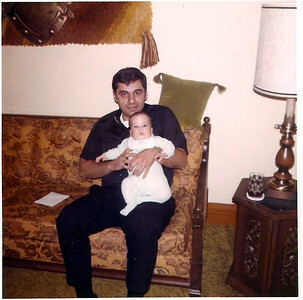 Dad and Uncle John were inseparable as kids and as adults. They were brothers and best friends. 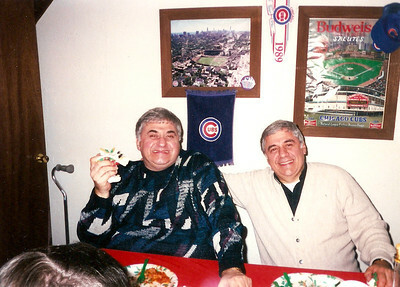 In preparing photos for Uncle John’s funeral, I found countless shots of Dad and Uncle John sitting together, eating, laughing, and enjoying each other’s company. That’s just what they did. When the news came that Uncle John was sick with cancer, it was a shock to all of us. Throughout his life, he always seemed so healthy– why did this have to happen to him? It didn’t seem fair. He fought for as long as he could against it– trying different kinds of treatment and new, innovative strategies to stop the spread, but eventually nothing worked, and he decided to let nature take its course. 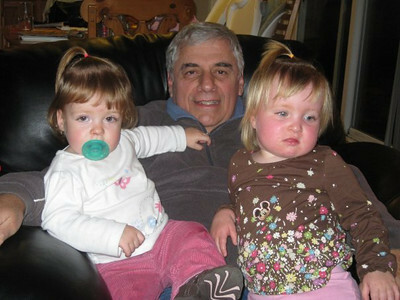 He did get to meet and spend time with my nieces, Abby and Emily, a few times before he was too ill to do so. I’m glad he did that, and I’m glad they met him. They never got a chance to meet their Grandpa. I’m sure Uncle John have great things to say about them when he sees Dad again. My last conversation with him occurred at the funeral of another cousin, late last year. He was walking slowly, with a cane, but still getting around okay. We sat together and had a long talk about life, things that we’ve experienced, and how he was doing. I didn’t know at the time that this would be our last real talk; but it’s one I will treasure and remember for the rest of my life. On Thursday and Friday of this week, our family will gather to say farewell to Uncle John, with hundreds of others who will come to say farewell to “Father John.” That’s the one thing I always admired about my Uncle. He was a man of great spirit and faith, but when he was with family, he was never “Father John.” He was “Uncle John,” from the day I was born to the day he died. His faith and spirituality was always a part of him, but he made sure to keep it separate from his family life. He loved us unconditionally. And that was never in doubt. Five years have passed by so very quickly. And yet, every July 3, I recall that day, vividly. I recall the surreal, foggy morning in Saugatuck. I was camping with my friends, and decided to call my dad for the first time that weekend. The calls went unanswered. I recall seeing “The Devil Wears Prada” with my friends because it had rained that morning, and not being able to enjoy the movie because I kept checking my phone to see if he had called me back. And then, after the movie, getting the news that tore through my heart. The ride back to camp, and arriving to find my tent taken down and my car already packed. I will never, ever forget the kindness and love from my friends as they worked so hard to get me out of there as fast as possible. Getting my friend Rafael to drive my car so I didn’t have to drive it myself was another blessing. I don’t remember much of anything from that trip. I just wanted to get home. Sitting in my mom’s kitchen that night, hearing fireworks going off in the distance. The low thuds of each explosion marking the celebration of the holiday that was, on that day, dead to me. What was there to celebrate? I was mourning. Independence Day would never be the same for me, and hasn’t since. The planning, meetings, dinners brought by from friends and family. Lots of decisions, and lots and lots of tears. That was all part of it, too. As rough as that day and the days that followed were, it somehow made our family that much stronger. We never broke under the pressure and kept on going. There was immense sadness, but also immense relief. Dad had suffered for so long, and by the end of his life was so miserable, that he made us miserable, too. I guess what kept us going (and sane) through all of that was knowing that he was finally at peace. And consequently, we, too, were at peace. I wrote about all of this five years ago, so I don’t want to re-hash every detail… but in the five years that have passed, so much has happened. My nieces were born, and have given such joy to our lives. How I wish he could have met and known Abby and Emily. Part of me believes he does know them, and is watching over them closely; but had he been alive to meet them I know he would have loved them dearly. 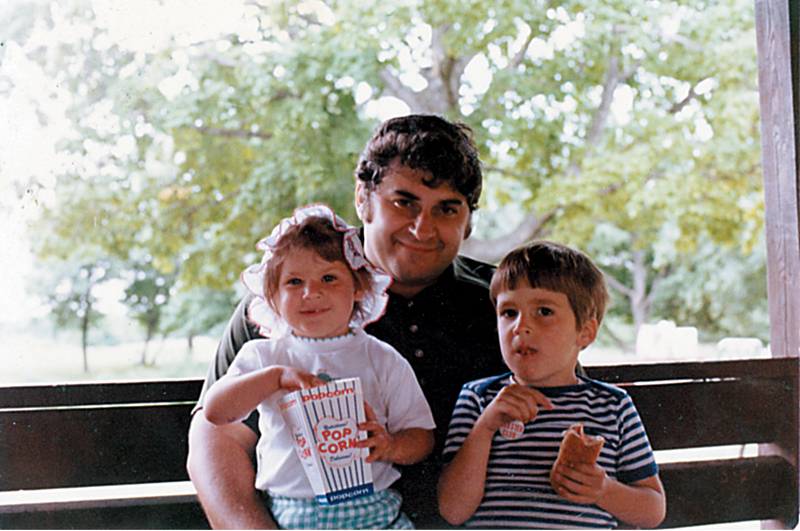 But on the other end of the spectrum, my uncle– my dad’s brother– is nearing the end of his battle with cancer. Unlike dad, his suffering is lingering. I hate what’s happening to him, and how cancer has robbed him of not only his ability to live his life, but his will to live. Once again, when the time comes, we will have sorrow, but also thankful he is no longer suffering. So this year I am spending the holiday with my family. I’m sure we’ll share some tears, but many more happy times. And we will celebrate Independence Day. Because although I thought it was dead to me five years ago, eventually, I have to move on. Dad, wherever you are– I love you. You’ll always be in my heart.